Mazda's ‘active' safety technology to help drivers avoid accidents or reduce the severity of collisions has resulted in cheaper insurance for the owners of every Mazda CX-5. Because Mazda's ‘Smart City Brake Support' (SCBS) system is standard-fit across the CX-5 compact SUV range, the ABI (Association of British Insurers) has decided to lower the original insurance group ratings for this model by two groups - across the 18-strong line-up - from 20 October. SCBS is an automatic emergency braking system which uses radar sensors in the front of the car to monitor the closing distance and speed to the vehicle in front. If the system detects that a collision is likely and the driver hasn't reacted in-time, the system applies the vehicle's brakes to prevent the accident or reduce its severity. The system is most effective when the speed difference between the driver's car and the vehicle in front is less than 19mph. The ABI's decision was taken after comprehensive tests of the SCBS were conducted by the Thatcham Research Centre. Thatcham has been working closely with the EuroNCAP safety organisation to understand and quantify the benefits of fitting automatic emergency braking systems. If systems like Mazda's SCBS become a universal fitment, it is estimated by EuroNCAP that road accidents in Europe could be cut by 27 percent, saving 8,000 lives a year. 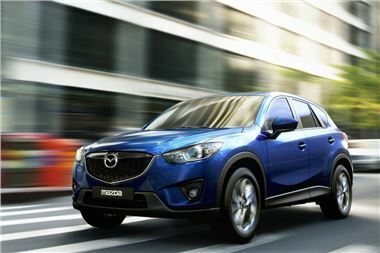 The Mazda CX-5 range is priced from £21,395 to £28,995 (OTR) and now has insurance group ratings from 15E to 21E. Customers have a choice of petrol and diesel engines, four trim levels (SE-L, SE-L Nav, Sport and Sport Nav), six-speed manual and automatic transmissions and 2-wheel drive (2WD) or all-wheel drive (AWD) - depending on model. Thanks to having SCBS fitted as standard on all models, the ground-breaking Mazda CX-5 was voted joint-winner of the ‘2012 Safety Award' last week at the annual Scottish Car of the Year ceremony, where its automatic emergency braking system earned high praise from the Association of Scottish Motoring Writers. Last month, Mazda's CX-5 was crownedWhat Car?Green SUV of the Year, averaging a remarkable 47.2mpg in the magazine's ground-breaking True MPG test. In June, the Mazda CX-5 was crowned ‘Best Crossover' in the 2012Auto ExpressNew Car Awards for its "...space, quality and style with a great drive and incredible efficiency". Great to see these features recognised - the ncap video tests on youtube are really impressive too. Can't wait to get mine - long wait though - ordered in august due jan/feb!